I’m excited to have yet another well respected Toastmasters and gifted speaking coach share her expertise with all of us. Please feel free to share your thoughts and comments below! Susan- thank you for your contributions. For all of my Toastmasters friends, Susan was referenced in the most March 2013 Toastmasters Magazine article, “When Bad Speeches Happen to Good People.” Congratulations on all of your success, and thanks again! If you’re like most people I meet, you make lists every day. “To-Do” lists are a regular favorite. There are lists of activities; lists of things to take when you travel; lists of projects you’ve worked on. The similarity between all of these lists is that you jot down one word or two and then you know the whole story behind those short words. If you can make a list, you can write a speech. Why? Because just like these lists, each word you list for your speech represents content you already know. When you see the word, you know what to say. The number one barrier to gaining confidence and success as a speaker is that you spend too much time writing and not enough time practicing and rehearsing. My clients regularly report that when they practice/rehearse 10 times or more, they actually feel their own improvement grow from within. My pie of time approach recommends allocating 40% of your time on content and 60% of your time practicing and rehearsing. You can easily hit the 40% mark if you use your list-making skills to create and organize your content. Don’t write everything out; simply rely on the one or two word note to prompt yourself to speak about what you already know. Download my Write a Speech Now model to help you get ideas about the kinds of varied content you should include on your list. Post your thoughts in our comment box about how list-making will help you with speech writing. I am very excited to include a special guest blog from an award-winning business author. I met Blanca in January at the 2012 New England Book Festival where “Empower Yourself for an Amazing Career” won the business category. I found we hit it off and have very similar beliefs and opinions on professional growth. I look forward to a continued partnership–thank you for the contribution. Keep reading to learn how to “Project Confidence,” and check out her website and book. Your opinions and comments are encouraged! 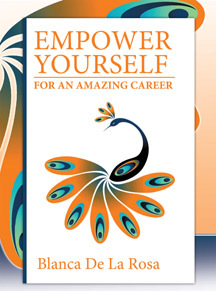 Self-confidence is one of the key ingredients required for a successful career. Projecting a lack of confidence and knowledge will construct barriers that may impede the growth of your career. You need to project confidence and never think that you are not as good as or as smart as the people around you because of your cultural background or education. Have faith in your skills and abilities and do not allow the cultural mantra of the organization or your peers affect your self-confidence. Some people appear to be born with self-confidence, but most have to work at it. Self-confidence can be developed and nourished. However, getting it right is a matter of striking a perfect balance between low-confidence and over-confidence that is realistic and represents your true ability. Do not waste too much time worrying about what others may think and instead focus on the task at hand. Feel comfortable with themselves, their abilities, strengths, and weaknesses. Are willing to take risks, readily admit their mistakes and learn from them. Graciously accept compliments recognizing a job well done without downplaying or exaggerating their role in the situation. Know how to set and attain reasonable goals. Take the time to appreciate and celebrate their success. It is human nature to experience an occasional secret fear that one is not good enough. You may feel that everyone else has it all together and that you are the only one struggling to keep it together. Don’t let a false sense of self and the opinion of others affect your self-worth and self-esteem. You can look up to people, but only if it is not at the expense of your own self-worth and self-esteem. Regard these people as your role models, people you want to learn from and emulate. And, as you grow in knowledge, strength, and status, stand beside them as your peers. Be presumptuous enough to believe that you are just as good as, as smart as, or better than those around you and that you have a significant contribution to make. Don’t talk yourself out of greatness. Lord knows that there are probably plenty of people around you who are already working on that.